To see a gallery of photographs for this article, click on the image. I was eating dinner on the wrong river. The boat chugged quietly in the twilight as a waiter brought the soup and poured the wine. The silhouettes of palm trees were dissolving into darkness after exploding out of a carmine sunset. Hippos snorted as we approached and, at lulls in the conversation, I could hear a faint roar from the falls. It was a marvellous evening on a restaurant boat on the Zambezi – except that I was supposed to be on a houseboat on the Okavango. The notion of an Okavango houseboat may be unusual, but they’re out there. At least four of them ply the permanent waters on the part of the Okavango River called the Panhandle, just above the fan of the Delta. The obvious way to get to a houseboat on the Okavango is to fly to Maun, then catch a charter flight to the Panhandle. But flights into Maun aren’t affordable for the average South African and charter flights are expensive even by oil sheik standards, so I went to Vic Falls with a friend instead. But the floating dinner on the Zambezi was only an appetiser. Glenn and I met up with Zimbabwean buddies Brett and Alan the next morning to drive through Chobe and Caprivi to Shakawe on the Okavango River. This is where the Ngwesi houseboat is moored. It’s a six-hour drive on good roads and there are elephants and sable antelope to cheer you on your way through Chobe National Park. Thanks to that strange souvenir of the scramble for Africa, the Caprivi Strip, there are also three sets of border officials. As a newly qualified expert on this area, I am proud to be able to share a couple of valuable travel tips with you. One: take lots of pens. Four people times six immigration forms divided by one pen equals more time than is strictly necessary staring at government posters about the dangers of Kariba weed. Two: wear waterproof boots, not flimsy flip-flops. You are going to be told to stick your feet in scary brown sludge several times. This is supposedly to prevent the transmission of foot and mouth disease, but I suspect it’s really a Candid Camera prank. You don’t want your horrified face all over Namibian television, do you? Once we’d undergone these and other tests of African travel, we were allowed to board our houseboat. I was expecting something along the lines of the QE2 – sumptuous and sparkling white. According to everything I’d heard, the Ngwesi is the most luxurious houseboat on this part of the Okavango River. I hadn’t heard that it’s also the only houseboat on this part of the Okavango River. I looked around, lowered a pair of enormous sunglasses and said in my best Paris Hilton voice, “Where’s the swimming pool?” There wasn’t one. There was a river, of course, but pink squishy things in bikinis tend to get chomped by hippos and crocodiles. Not exactly gruntled, I went to inspect my cabin, where I stubbed my toe on the bed that almost entirely filled it. That must have been the last test, because everything got better from there. A lot better. Francis and Bob, our captain and cook, cast off from the steaming shore. The day went from dreary to magic in 0,6 seconds and a cool breeze blew away my bad mood. The Ngwesi, unchained and forging sturdily up the centre of the swift river, lost its landlocked ungainliness. As the boat followed the sweep of the Okavango’s broad curves, the sky was saturated with the colours of a tropical thunderstorm and pink lightning flashed far in the distance. African skimmers took flight from sandy coves. Crocodiles slid silkily off sandbanks. Fish eagles did their cellphone-ring thing. Otherwise, there was only papyrus, palm trees and the good ship Ngwesi. The Okavango River was all ours. Now what? Silly question. If the fishing tender boats we were towing behind us didn’t give it away, the name of the boat did: ngwesi means tiger fish in Tswana. 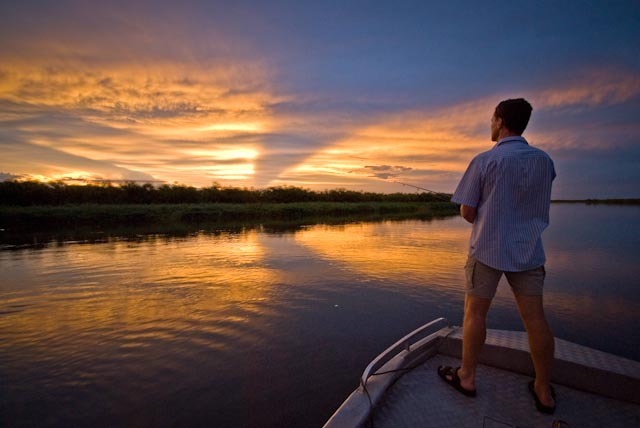 The Okavango River is home to about 80 species of fish, including 11 kinds of bream, two types of barbel, African pike and the famous fighting tiger fish. The Okavango Panhandle is also famous among birders and fishers for one of the most frenzied wildlife migrations in Africa: the barbel run. Every year between September and November, thousands of barbel swim upstream to breed. They are followed by predatory fish – especially tiger fish – and by vast numbers of birds who feast on the fish. With fantastic timing, we’d arrived exactly a month too late for the barbel run. Fantastic, because although birds and fish are all very well, I’d exchange both for a bit of peace and quiet, and your chances of either of those during the barbel run are slim. Alan, Brett and Glenn probably disagreed. You know you’re on a fishing trip when your day reminds you of the song that goes: “The beer I had for breakfast wasn’t bad, so I had one more for dessert.” My breakfast beer was a light one – a St Louis from Botswana. It wasn’t bad at all, so I poured a sip into the river. It’s a fishing superstition I learned on my first tiger hunt on the Zambezi. You offer the spirit of the river some beer in the hope it will give you some fish. Taking a girl fishing can be a bit like taking a man shoe-shopping. We demand diversions, such as being taken to the other side of the river to look at water lilies. But we have our uses. Right next to those water lilies, Glenn hauled in a huge barbel as long as his arm. Glenn doesn’t catch fish very often, so he was as pleased as Punch (the barbel, I’m afraid, was as ugly as Punch). I knew the reason he had hooked his fish was because I had made the appropriate offering. So I opened a second beer and poured a little more St Louis Light into the water. But it must have been a case of too little, too light. While I was struggling to disentangle my lure from another bunch of weeds, Francis caught a fish. “I’ve caught a tiger,” he said, in an oddly restrained voice. We turned to look. Then we looked again and saw it. It was the tiniest tiger fish I’d ever seen – not much longer than a pen. Francis eventually had his revenge. As the sun was setting over a quiet lagoon, he caught a fat nembwe, then hooked a small crocodile. (I’m not sure what we’d have done with the crocodile if he’d landed it, but we ate the nembwe. It was delicious.) In all the excitement, my Paris Hilton sunglasses fell overboard and sank. Perhaps the Okavango River has a female spirit, because shortly before dark, Brett caught a 15-pound (6,8-kilogram) tiger, a hardened hitman of a fish. “What day is it, anyway?” I asked Glenn one morning. It had started the same way as every other day on the houseboat. A silvery sun drowsed in a duvet of cloud, oiling the river’s buttery ripples. The river was hushed, hurrying downstream almost soundlessly, giving a gurgle of greeting every now and again when it met our boat. Baby breezes teased the languid air. Tropical boubous tried over and over to tune their calls. At some point I’d come unstuck in time, drifting in daydreams. We’d been there forever and no time at all. But Glenn’s watch said Saturday: our last day. As the tender boat took us away, a hippo gave chase as if to shoo us off for good. I could understand that. After only four days, I’d started to feel I owned the Okavango. Now I’m a landlubber again, but happy thoughts of warm and sunny days on the river are my undisputed possessions. Somewhere in the fast-flowing current of the Okavango, there’s a peace-loving hippo enjoying a holiday. Somewhere out near Shakawe, there’s a small crocodile wearing enormous sunglasses. I bet they look good on her. Posted in Feature articles, Southern AfricaTagged botswana, caprivi, chobe, fishing, hippo, houseboat, okavango, zambezi, zimbabweBookmark the permalink.